Some of my favorite Stampendous products are those gorgeous jars of powdered goodness that melt when you heat them into wonderful backgrounds, borders, and focal points. Yep, heat embossing powders and enamels. This one has completely melted and “colored” my bird- I inked up that portion of the bird with a Versamark pen and spinkled gold enamel on it. He also wears a glitter crown “attached” with liquid adhesive. The purple lacey background on this layout was stamped and embossed on purple cardstock soo it would stand out and look texturized. I wish you could see the texture on photo. 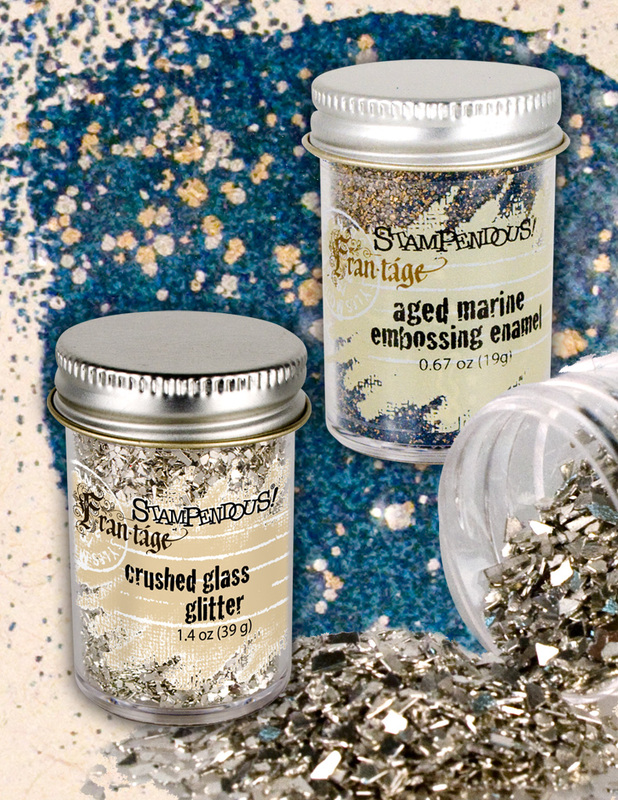 Stampendous keeps mixing up new, wonderful powders for our fans, and our new Fran•táge Embossing Enamels are already favorites with stampers worldwide. Why not treat yourself to a new powder or two, or pull out one you bought but haven’t tried? 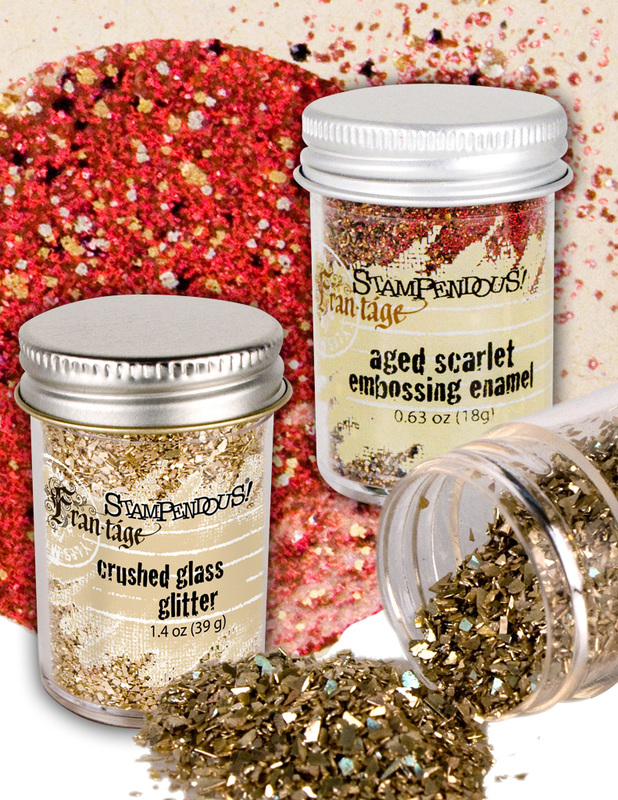 You can find all our embossing powders on the Stampendous website HERE – or find a local retailer near you! Your creations submitted for September’s Challenge don’t have to use Stampendous images, but if they do, they’ll count as two entries. You need to have your submissions linked to our linky tool below by 11:59pm PDT on October 4th. You may enter as many times as you like. 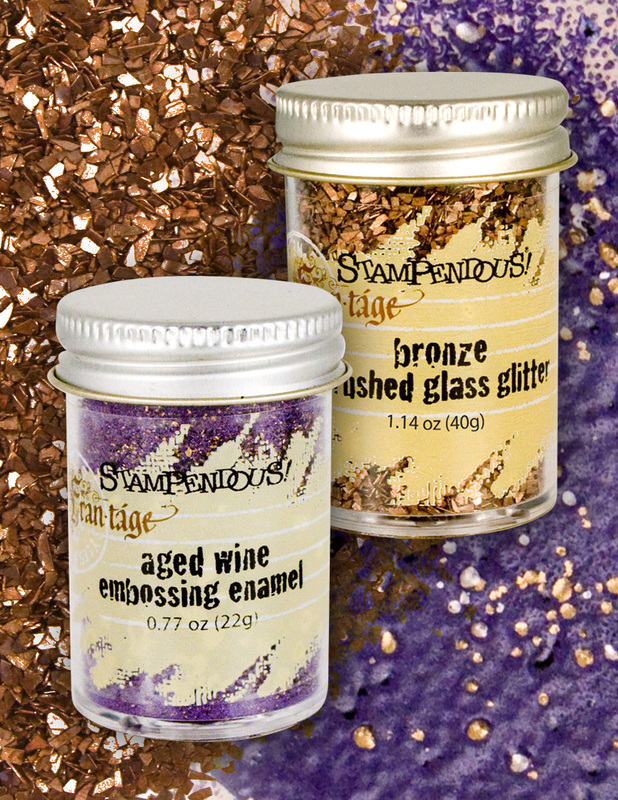 Our prizes this month are, not surprisingly, some of our Exclusive Fran•táge Embossing Enamels. How about our newest colors??! We’ll choose three winners to receive some super hot Essentials. Of course you know our favorite embossing technique right now is Fran’s Encrusted Jewel Technique. This super easy, but super dynamic way of creating cool, dazzling, vintage pieces is really fun, and we just can’t get enough. Our Design Team has been using this technique and these gorgeous Enamels for several months, now, with stunning results. They’ve created a batch of terrific projects for you to enjoy. Here’s a link to each of their blogs. The links will stay up all month so you can see all their projects any time.